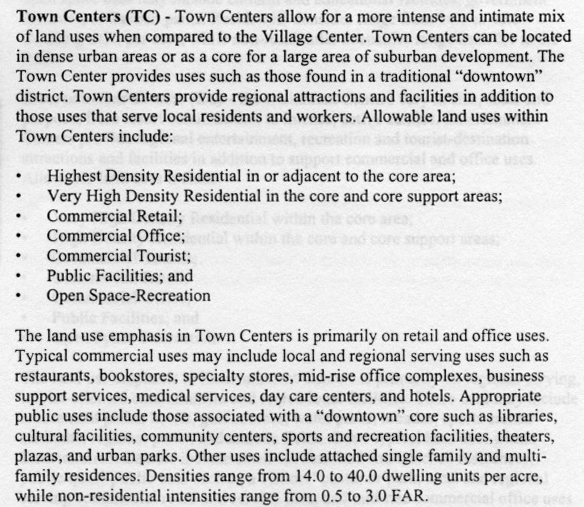 An excellent example of a Town Center would be Victoria Gardens in Rancho Cucamonga. Los Corralitos-B has, as its southern border, Prielipp Road. It leads into Jackson Avenue in the California Oaks development. California Oaks is a 10,000+ dwelling unit residential development. All traffic into and out of the northwestern portion of California Oaks is via Jackson and Prielipp Roads. The property is designated Industrial/Business Park. Recent land-use policy changes at all levels of government; federal, state, county and city suggest that this parcel may be found acceptable as a mixed use development. Said uses would include light industrial, commercial and residential. The residential might even be high-density. Proposals would be evaluated on a case-by-case basis. Clinton Keith Road east of I-15 along the northern border of Los Corralitos is presently a four lane paved road linking up I-15 and I-215. Clinton Keith west of I-15 goes past the Bear Creek Golf Resort and the western housing developments of Copper Canyon as it wends its way into the Santa Rosa Plateau. It serves as the closest access to the I-15 and I-215 freeways for northern Murrieta, southern Wildomar and the surrounding housing developments. It is the only access road for the entire Santa Rosa plateau including Bear Creek, and the housing developments facing Clinton Keith. The entire Clinton Keith road easement, presently 110 feet wide, will be widened to 162 feet. It is designated as a high speed, limited access thoroughfare. The west side has been recently improved to 5 lanes. The on/off ramps to the north and south I-15 have been doubled to two lanes each and traffic lights installed. The planned widening of the I-15 overpass to accommodate the widening of Clinton Keith, and further improvements of the on/off ramps have been completed. In order to accommodate a 214 unit-housing tract, Jefferson Ave. is being extended through the southwestern corner of the CKC Center to empty out onto the S-curve that marks the location where Washington Ave. changes its name to Palomar. Though designated as a 110 foot right-of-way eventually carrying a minimum of 4 lanes and as many as 7, two lanes will be constructed coincidentally with the construction of the housing project. A 110-foot right-of-way will continue from the origin of the Jefferson’s westward curve straight north through the CKC center. Of all the cities in the Temecula Valley which include Temecula, Murrieta, Wildomar and Lake Elsinore, Wildomar, the city in which these properties are located, has the lowest developer fees. THE INFORMATION IN THIS BROCHURE WAS ACQUIRED FROM SOURCES DEEMED RELIABLE BUT IS NOT GUARANTEED. ALL PARTIES ARE ADVISED TO MAKE THEIR OWN INDEPENDENT VERIFICATIONS OF THIS INFORMATION.